From the Dr. Seuss collection by Vandor. 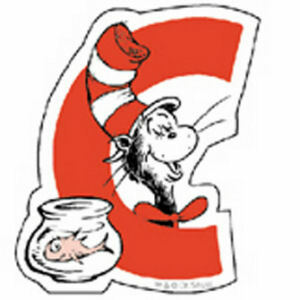 Dr. Seuss Magnetic Wooden Letter C.
This Item is in stock and ready to ship. You should not postpone your purchase and miss out on adding Dr. Seuss Magnetic Wooden Letter C to your Dr. Seuss collection! From the Dr. Seuss collection by Vandor. Made of wood and features a character from either Cat in the Hat - One Fish Two Fish - Horton Hears A Who or Green Eggs and Ham. measures approximately 2.75 InchesX 3.5 Inches H with a magnetic strip on the back. Vandor Dr. Seuss Magnets shipping from Canada. No Surprise Border fees or Customs!